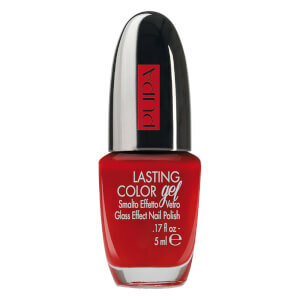 Achieve salon-worthy results from home with the PUPA Lasting Color Gel Gloss Effect Nail Polish; a chip-resistant, long-wearing nail varnish that applies effortlessly to deliver cushioned, gel-like colour without the use of a UV lamp. Featuring a maxi flat brush with 440 rounded bristles for perfect pick-up and distribution of colour, you can expect a smooth, plump finish with mirror-like shine. Toluene, formaldehyde, DBP (Dibutyl Phthalate), camphor and paraben free.